"Hey, this is probably the end of the arc, maybe something nice will happen!" Hahaha, no. This is Attack on Titan, why would anything nice ever happen? As anyone who has access to my Tumblr is well aware of at this point, I've become more than just a little obsessed with Attack on Titan over the last couple months. I'm planning on having my review on the anime up in the next couple weeks I swear, and I'll go more into why it's taken over my life in that post. In the meantime, my obsession has demanded that I catch up with the manga, which brings a whole bunch of interesting developments that the anime didn't get to touch on. The characters and plot arc of this series fascinate me, so on the spur of the moment I decided to start a new monthly installment discussing the new chapter. "But Muse! Isn't this an anime blog?" Yes it is, but I also do what I want. The whole reason I made this blog in the first place was to have a space to gush and wildly speculate about my favorite series, and right now that's Attack on Titan. These posts will probably be similar to my episodic posts, with the focus on plot and character developments. Gotta use that writing degree somehow, and there's not much point in talking about the art here since 1) my drawing skills begin and end at stick figures, and 2) the art in AoT is wildly inconsistent. I'll comment on expressions, but not much else. This last part may go without saying, but expect spoilers. But on to the chapter itself! This one's more of a "breather" as far as the manga pacing is concerned, although--as always--the characters are dealing with some heavy stuff. The first part of the chapter is an unfortunately familiar sight; the majority of the people who went out on the mission are dead, and most of those that remain are injured. 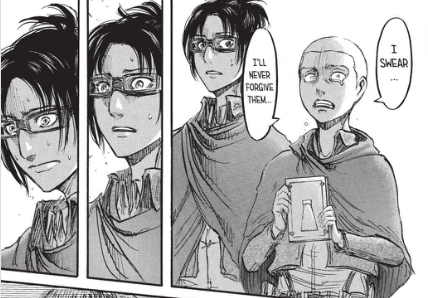 The only difference between this time and the last major mission outside the walls is that they technically succeeded; they got Eren back! 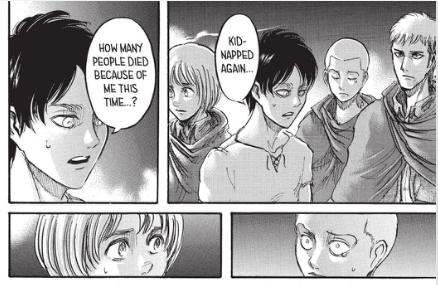 It doesn't feel like a victory though, and now Eren--again--has to deal with the angst of knowing that a lot of people died because of him, and he doesn't know how to make it up to anybody. 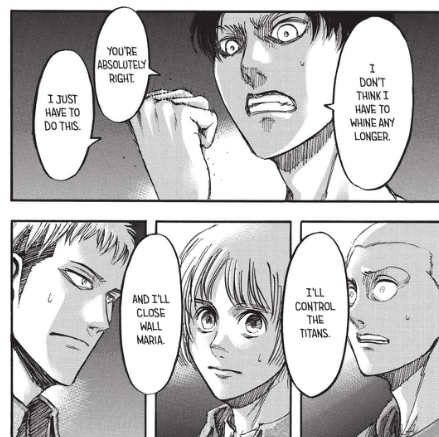 But there is one bit of a bright spot; if Eren can learn how to harness the power he used at the end of the previous chapter to control the mindless titans, then its possible that things could get a lot easier. There's speculation circling in the fandom right now that this power is the "coordinate" that Reiner and Bertolt were talking about, but I'm not so sure. It's already been pointed out that we've seen this power before, like when Annie called all the Titans in the area to devour her Titan form so she could get away. 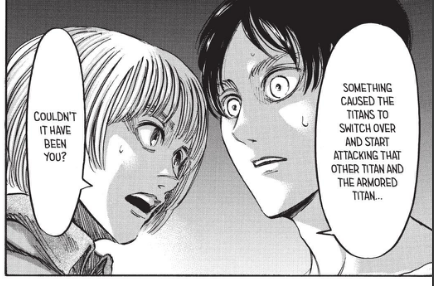 However, Eren wasn't screaming as a Titan, so I agree with the speculation that it might be some kind of mind control. Others in the fandom have pointed out that the Titans in Trost may have continued to attack Eren after he transformed because he was unknowingly using his powers to command them to fight him. 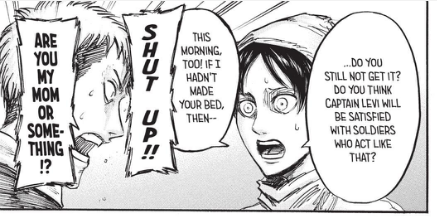 Something about Eren constantly subconsciously screaming "COME AT ME BRO" strikes me as funny, but given his unending hatred of Titans it makes sense. 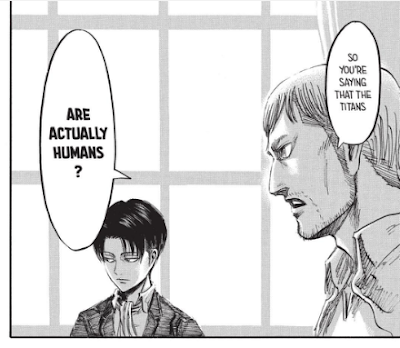 That said, there are still a lot of unknown factors here (who know what other powers Titan shifters have that Eren isn't aware of) and the line of thinking that the characters show here is really similar to when Eren had to prove himself to the military. Yes, having a Titan Whisperer would great, but Eren still doesn't have a handle on his Titan form to begin with. What was supposed to be a test run for a larger mission outside the walls had horrible consequences. Discovering the traitors in their group too late cost them even more. I'm just hoping that they'll come up with a really solid plan to get past the wall this time. This series has conditioned me to expect the worst whenever characters make dramatic proclamations about what they will do next. The big reveal for this chapter though was something that's been guessed at for a while now: the Titans were humans all along, and this group in particular came from Connie's hometown. How they transformed is anyone's guess (although I'll be really surprised if the creepy as heck Ape Titan isn't responsible somehow), but it's the only explanation for how titans were able to attack without breaching the wall. 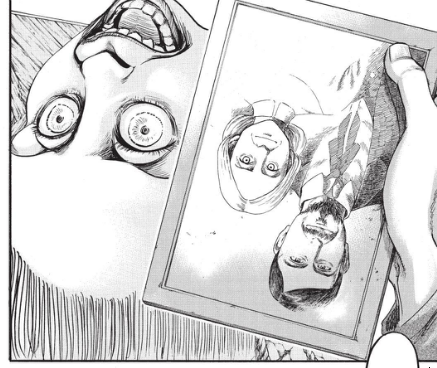 In any case, this opens up a whole new level of disturbing possibilities for the plot, since one person has already pointed out that Sasha probably killed Connie's dad a few chapters back. If this means that more dead characters will be suddenly resurrected as Titans...actually, I don't even want to finish that thought. This is a fascinating turn for the story to take. A lot has been said about how Attack on Titan goes against shounen tropes, but I think there's a more discussion to be had on how this works as a war narrative. It presented itself at the beginning as a "Us vs. Them" story, giving the characters plenty of motivation to fight against an ambiguous evil, the perfect boogeyman. However, ever since Titan shifters were introduced--and especially after Annie, Reiner, and Bertolt made things even more complicated with their ambiguous morality--the lines of good and evil aren't so clear cut anymore. Isn't that how it goes with war? You're convinced that you're on the side of good and righteousness only to find out that you were fighting people just like you all along. There isn't "winning," just survival. "The world is cruel" indeed. For the most part, the reactions to this are pretty much what you'd expect. Poor Connie gets to deal with the fact that not only was his hometown wiped out, but also that his family are now Titans. Hanji realizes that she was technically performing human experiments this whole time. Levi seems pretty upset about this too, which is not something we've seen very often. And then there's Erwin. Smiling while the people around you discuss the possibility of human brains being absorbed into man-eating monsters is definitely not the socially acceptable reaction. 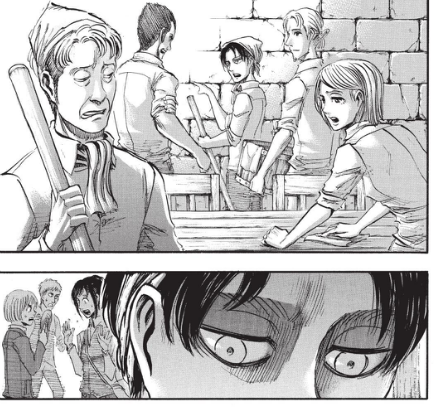 There are a lot of theories flying around about this reaction, from Erwin being in on the wider conspiracy with the Wall Cult to having a complete break with reality, but I think that it might be related to something else that we're not aware of yet. 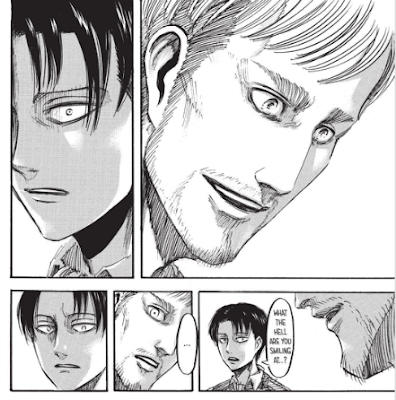 The short conversation between Levi and Erwin right after this moment seems to point to this. "Is that the real reason you're in the Survey Corps" seems to be particularly important here, with "that" being something that Levi and Erwin know about. Hanji's apparently out of the loop here, as shown by her confusion and Erwin immediately changing the subject. Right now, the whole scene just serves to highlight how much we don't know about Erwin outside of his role as Commander. 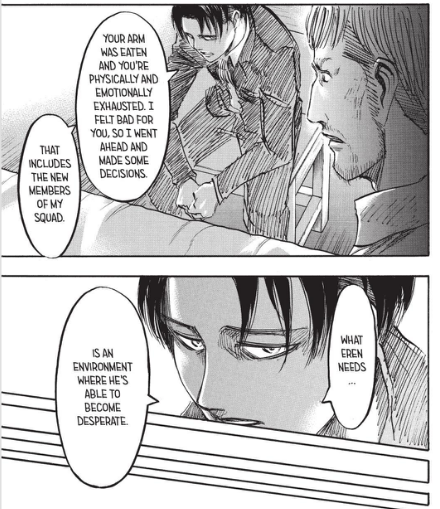 Anyway, while Erwin's been out of commission, it seems like Levi and Hanji's working idea was to get Eren and Historia away from the capital, and by extension, the higher-ups in the military who might be in on the conspiracy. 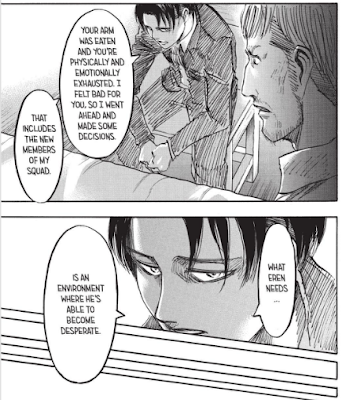 Apparently the easiest way to do this was for Levi to pull rank and claim the kids as his new squad, but his line about making Eren "desperate" is concerning. Maybe he thinks that if Eren is always around people that he cares about, it'll be easier for him to use his power? And then of course the last page has to remind us how the last squad ended up. More tears for the personal ocean. Whatever is being planned, we'll just have to wait and see. In the meantime, Levi having to deal with a squad full of teenagers is a pretty funny mental image. 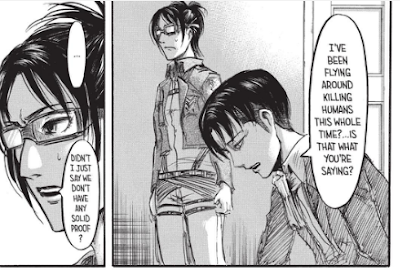 At least we got to see Eren being a dork while trying to warn everybody about how Levi runs things. Images from Crunchyroll.com. Please support the official simulpub. I'm more of a central-plot-focused person myself. Interestingly, the author/artist Isayama looks like a classmate of mine back from high-school, only Isayama has a much thinner face. RE. Valvrave ep 17: My theory WAS right, the Fuhrer's been possessed by a Magius! And now they're going to harvest the Moon(and Sakimori) module people! Oh no!!!!! Lol, they haven't even mentioned the basement for a while now! That's not to say that plot related stuff isn't happening though... And I'll leave it at that, since I don't want to spoil you and don't know how much much you read of this post. I think that they'll be getting back to that pretty soon, though. On Valvrave: Yep, it just keeps getting crazier! Now the question is, why? *Reading about the titans all possibly being humans* I KNEW IT!!!!!!!! I always had a sneaking suspicion as well! As for "how" and "why" though, we still don't know yet. It was always so obvious. Naturally the existence of titans originated due to the dna of humans being mutated. And the biggest irony I fear there to be is, a human having developed a method to create humans to become titans that devour other humans. Erwin though... I'm pretty sure that, that is more of a pained smile of irony on his face.